In common with the rest of the current Onkyo receiver range, the TX-NR905 is a big, brutal-looking block of a machine – though the black finish of our review sample looks less intimidating than the silver that's also available. As you would expect from a receiver at this sort of money, it's generously specified and should be able to function as the engine for even the most expansive system. The ‘tech specs' panel gives the full details, but consider these particular highlights: the '905 has four HDMI inputs, so is able to support all the HDMI-enabled products you might be likely to own at once. It's also packing two HDMI outputs, so lucky folk with both a flatscreen and a projector can switch between the two without any unseemly groping around the back of the equipment. The ‘N' in the model number refers to the Onkyo's networking ability, and while it's not the most intelligent or intuitive networking receiver we've seen (it doesn't import internet radio station names automatically, so you have to find them manually, and there's no wi-fi built in), it's an able and logical facility. It's movie sound that is the raison d'etre of a product like this, though, and the Onkyo is an absolute powerhouse. 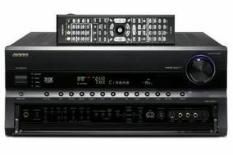 Whether decoding the DTS HD-Master 7.1 soundtrack to our Blu-ray of Oldboy or the standard, Dolby Digital 5.1 soundtrack to a DVD version of Control, the TX-NR905 delivers a soundstage of simply prodigious dimensions. Effects are steered with precision and alacrity, integrated effortlessly into the soundtrack as a whole while simultaneously remaining distinct and easy to follow. The Onkyo is able to sweep from the very bottom of the frequency range (where it is monumentally solid and substantial) to the very top (crisp and attacking) seamlessly and it allows dialogue the space to communicate without being overwhelmed by the sonic pyrotechnics going on all around. Few receivers at less than £2000 have the '905's cast-iron grip and authority; even fewer can summon this sort of trouser-flapping low-frequency presence while remaining quite so poised. By these standards, music playback is a slight letdown. There's the signature drive and attack, plus a deft facility with voices, but the '905 is fractionally blurred at the bottom end. It's more than a match for price-comparable competition, mind, which means the award of five stars is as predictable as night following day.